Last night we rushed home, crammed in supper and headed off to the Worcester Art Museum to see talk by Doctor Jeffrey Forgeng. We hadn’t seen him in some time but it was nice to get a hug. (I’m not name-dropping, I’m just expressing surprise!) In fact, it was a bit like old home week for the (now defunct) Higgins Armory sword/study guild and we tried to catch up a bit with some of the other folks who arrived to hear/see about this beauty and the Meyer Fightbook (The Art of Combat (Die Kunst des Fechtens). 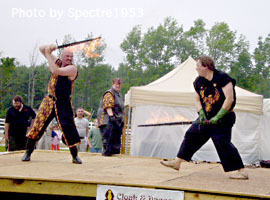 First Jeffrey talked about his own journey from studying medieval practices to swordplay to historical swordplay. He featured some of his works and translations and discussed his sources. And we only had the opportunity to see the book as a slide (it will be displayed later-http://www.worcesterart.org/exhibitions/jeppson-idealab-art-of-combat/)But Curator Bill McMillan brought around the longsword so we could ooh and ahh over it. It’s in superb shape. And then Kendra and Mark from CHEMAS (Cambridge Historical European Martial Arts Studies Group) demonstrated some longsword and dussack technique. And we popped in to enjoy The Last Judgement Tapestry and confirmed that Justice wasn’t having with all that sin nonsense at the point of a longsword. But if you get a chance when it opens , be sure to pop in and see both the longsword and the treatise. There is, of course the traditional kind that is from Loki and after hours gambols, but this isn’t that sort. The type I’m talking about is this kind; standing in the living room, surrounded by dirty clothing and leather articles, you feel like you were just booted out of Narnia and are still holding a handful of dry leaves as the only proof you were ever there. I often feel this way after the Gulf Coast Renaissance Faire. It’s sizeable and the purists may poo-poo it but I love it because it’s inclusive and unpretentious. It is “Y’all want to have a good time? !” sort of rolled into a sandwich and swallowed whole. This faire welcomes Zorros, Samurai,Cosplayers, gamers, furries, pet enthusiasts, lost country faire goers, your Uncle Fred and anyone who has put on a coin belt with a pirate hat or velvet tights with a tee shirt. You can buy mead to go with your fried pork rinds and we always see the aluminum siding guy-usually near the girls scout cookies, camel rides, climbing wall and bouncy castle. The owner did it as a gateway faire of sorts, bringing the magic to people had never been to one before. “Just do what you do and we know you’ll keep them entertained.” So yes, we’ve done hour and a half sets when other acts bailed, we have performed for the last five people at the faire, and we’ve had folks break that fourth wall and give whip and devilstick lessons to the patrons. We work the gate, we work the lanes, and this last time, my husband was actually escorting people with electronic tickets to the gate! But we do this for love and because faire does well-we do well. I’m not saying that our faire lives don’t inform our day jobs and cross back again. But they are two different workplaces that are VASTLY different. It’s a tough thing to have people tell you how happy they are to see you, offer you booze, clap for you, sing with you under the stars, offer up their secret dreams and then…go home to shuffling papers, writing email and generally have to keep how much you use swords or fire under wraps, lest you upset the apple cart. For me, being free of social media, the phone, housework and all things attention-demanding is a terrific vacation. I might put something on the Phoenix facebook to pique interest but then, done. And at the faire you are a mythical creature. As my friend Amy has said, when you put on the uniform, you ARE the job. When I pop on my @$$ kicking boots and kit, I’m out to do THE THING-which is be friendly, make connections, inform, and before all else, entertain! It requires high energy levels because you have to give out to get back! And it’s fun to be a stealth performer, you know, just quietly make your way out on stage and then BLAM the volume knob goes up to 11 and you are blasting into the crowd with unseen energy. I’m reasonably good at it and can walk through a crowd with a handful of swords or a pollarm and no one looks up from their corndog. But I have to be careful stuffing that genie back into the bottle because when I’m tired, my “filters” are thin and frail. ME: Stare if you want but if you don’t move, I’m peeing on your shoes! And let’s face it, if your title was “Queen of all you survey” or “favorite jester” or Naughtiest bandit” those are some big boots to put away and not take out again for a while. I’m not telling people to live in a small way out of costume or character. It’s not bad it’s just different. If you didn’t have a little royalty, bandit or clown in you, there would be no wellspring for that performance. But it’s definitely a superlative that we set out on stage, freak flag unfurled for the masses and waving free-very empowering. Sort of our terrifying, naked, vulnerable selves. So when I am feeling sad while I shake out some underthings and red clay comes filtering out, or shake a boot and a stone that traveled 1300 miles with me rolls onto the carpet. Sure I’m a little sad and it will be a while before I’ve wrestled a bit back into my “faire mouth.” But it’s a hangover I wouldn’t give up and although it’s a bit painful, it’s an addiction I can live with and enriches. Bonus: While looking for suitable images, I came upon this term Faire l’andouille and now you’ve learned something new. I’ve been terribly neglectful and I apologize. And all else was consigned to not giving a rat’s patootey. Not promising anything but hopefully I can finish ONE of the six posts I’ve started, we might have a thing going. This last weekend we attended the 2016 New England Reenactors Faire. In the past we’d gone as visitors and last year we gained two new troupe members via our member Andy who was wandering the aisles. This year we took it into our own hands to try and get some more members after the Great Baby/Marriage Decimation of 2015-2014. So we paid for a table and settled in for a wait. Everyone is working like crazy to get people into their group. But it’s definitely an itch and it’s not in one spot! Everyone has their fringe element. We had an unfortunate turn that sprung from having a Persian helm on our table. It was meant to be s show and tell or touch piece. It was not our “Tell me how much you hate Muslims” invitation. I want to thank whomever came over and distracted that gentleman and led him away from the table because it was not a good time for anyone in the vicinity. But he was the exception, not the rule. We had people far more interested in introducing people to the hobby than we did going on about witch hunts about inaccuracy so…yay! Lastly, I was happy that they had such good attendance and everyone was so down-to-earth. If we get members, then it was a good investment. If not, we still had a nice time.